This guide assumes that you already have Redis installed, but if you haven't yet find out how to install Redis in our knowledge base. On production level instances we recommend using Linux, however for testing/development Windows can be used as well. For this guide we'll be using Windows Server 2016. Change Redis configuration to only listen to connections made to the IP of the server it's being hosted on. Adding a firewall exception follows the same process that we covered in a previous guide, except this time we're going to add an inbound rule to allow incoming connection to port 6379 (the default port Redis uses). Once opened, we're going to find and edit the bind statement from using 127.0.0.1 to using the IP address of the server we're currently on. In our case our server IP is 10.0.1.20, thus we're going to change it to that. Be sure that your IP address is static and doesn't change over time, otherwise you'd have to constantly keep changing the configuration when sending and receiving data. On Windows you can quickly check your IP address by running ipconfig command in the command line. 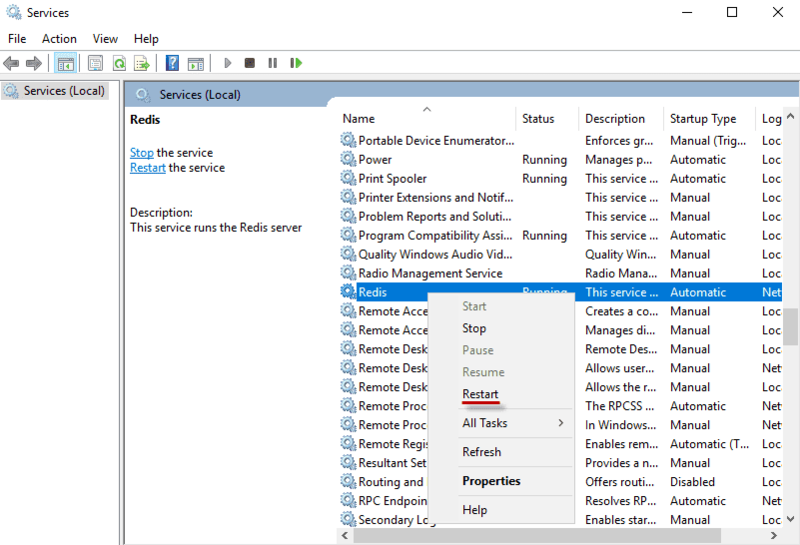 Type in services.msc, which should show you the services console. Now it's time to test if we can send messages to our Redis instance remotely. For this we're going to copy the 'redis-cli.exe' file from our Redis installation folder to our second server. This file will provide an interface to test our remote connection by sending a 'ping'. And now we have remote connection to our Redis server!